On Sunday, JSL was feeling sick and B had hurt her knees and hand in a fall. In order to give them some peace and quiet for awhile to rest, I took NHL out of the house. We ran a couple of needed errands and then decided to do something fun. We headed to an indoor mini-golf place that we’d been meaning to try. As we golfed, we marveled at the glowing courses and tried our best to get the balls in the hole. NHL even got a hole in one. At one point, though, I realized that the people in front of us were pausing after every hole to write down their scores. It occurred to me that I never even considered doing this. I think of mini-golf as a fun activity. The competition is with myself – seeing how few shots I can make a particular hole in – not with my fellow players. Keeping score might also make NHL anxious if he doesn’t do well on a particular hole. Besides, both NHL and I have a tendency for getting the ball near the hole and then making many, many failed putts. In the end, I find mini-golf a lot more fun without the score keeping. 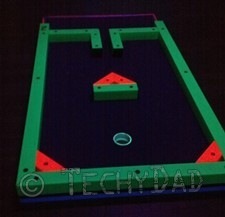 When you play mini-golf, do you keep score?